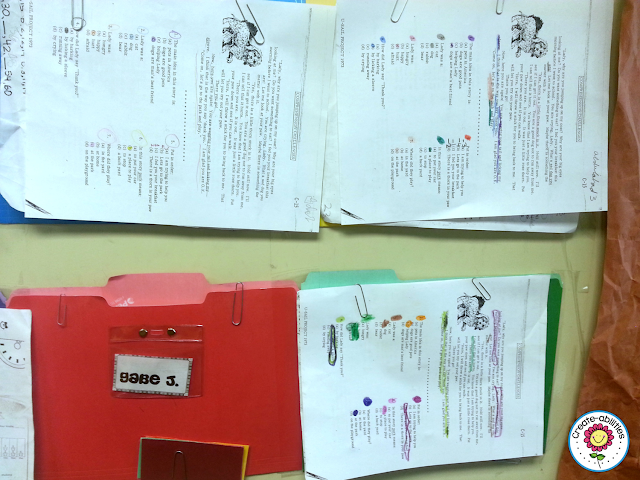 One thing that I have LOVED using in my classroom is wall folders. Wall folders seriously saved my sanity over and over. They help with classroom organization, collecting student work, grading, entering grades, managing late work, classroom procedures and more! I really have to give a shout-out to my site teacher when I was student teaching. She is the one who gave me the idea (one of many). 1. First, you take colored folders. I used the thicker ones for durability. 3. Tape the two short sides that are open with packaging tape. 4. Add three paper clips: Two at the top and one at the bottom. 5. Tape or secure to the wall close together. Here is an zoomed in picture of the folders. Now some teachers use the opening in the top for students to turn in work and get it passed back to them. That is an option. However, with how rough my little 3rd graders could be on paper, I didn't want to be changing the folders every single year. The folders in this picture are five years old. You could also have your wall folders hang vertically instead of horizontally. 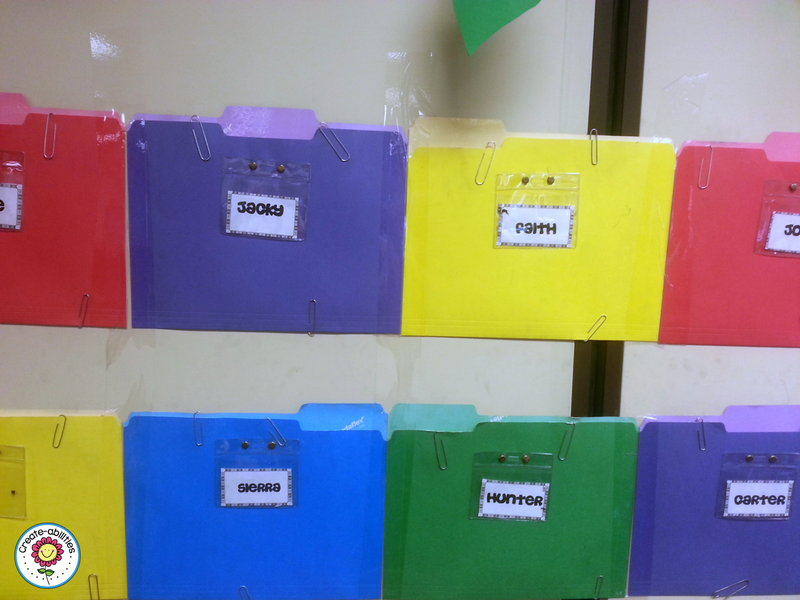 You want to organize your students alphabetically by last name. My first instinct was to alphabetize by first name because that is aesthetically pleasing and I'm a little type A. But if you alphabetize by last name, when the papers are collected to be graded, they are already to go in alphabetical order! This may only be an issue with me but having a stack of papers placed neatly on my desk by my class president in alphabetical order made entering grades SO MUCH easier! I didn't have to take the extra seconds to search for a name. Now maybe this is just something that bugs me, but seconds are valuable in the classroom and this is one thing that made grading much easier. The two paper clips are the top are for your students to turn in their work. They slide it up under the paper clips. I had my students always place their papers with their names on the right hand side. That way when they are collected the papers are all facing the same way in alphabetical order. This takes a little practice depending on your class but they usually pick it up pretty fast. I have only had a few students that push their papers up too hard and take the paper clips with them. They can fix that themselves (usually :)) pretty fast. The paper clip at the bottom is for their cards. The cards show who is missing an assignment and what assignment it is. I have many different colored pieces of laminated cardstock. They are about 2 x 4 inches. 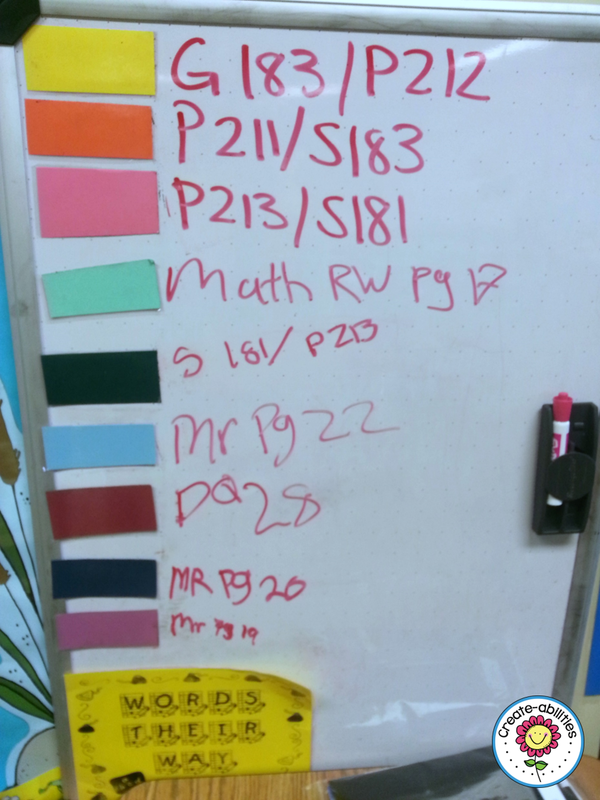 When a student doesn't turn in an assignment, my class president would write the assignment name next to a colored card. Then she/he would take that colored card and put it in the bottom paper clip to mark which students hadn't turned in the assignment. The president does this BEFORE they collect the other papers. Then the president would collect the papers from left to right across the rows and place the pile on my desk. So, for example, if a student was missing our grammar page 183 and practice page 212 (copied front to back) then they would have a yellow card. If they were also missing practice page 211 and spelling page 183 they would have an orange card. The students and I could look at the wall and see who was missing what immediately! They didn't have to come up to me to ask what they were missing and I didn't have to track them down and keep checking my gradebook to see who was missing what. Seriously fabulous. The best part is that my class president took care of all of this! If I had a class where I didn't trust a student to do this on their own then I had to be more involved but usually it went smoothly. At the end of the week any students with missing work were given an orange card that said late work. All the other cards were put back and the assignment names erased so we could start over fresh the next week. The student would have to come see me and I would staple all of their work together along with a note for the parents to sign and they would take it home for the weekend to work on it. Wall folders take up some space but if you can afford to give that up then try it! You won't be sorry!